← Picture of the Week – “Plant a Row” event at Logan’s Trading Co.
Electric Beanz Coffee Bar – More Than Just Great Coffee! I’m always on the lookout for places that have great coffee and free live music and I prefer to support local businesses whenever possible. With that in mind, my wife and I headed out Friday night to check out the Electric Beanz Coffee Bar located in Raleigh next to the Harris Teeter in the Kings Grant shopping center at the intersection of Ten-Ten Road and 401. As soon as we arrived I knew we had found what we were looking for. 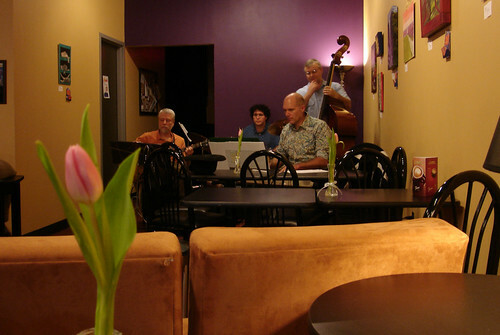 The shop has an inviting vibe which was complimented that night by the presence of a four piece band tucked away in the back corner playing mellow jazz tunes. My wife and I ordered our drinks and chatted with the friendly owner who explained their weekly specials and upcoming events. 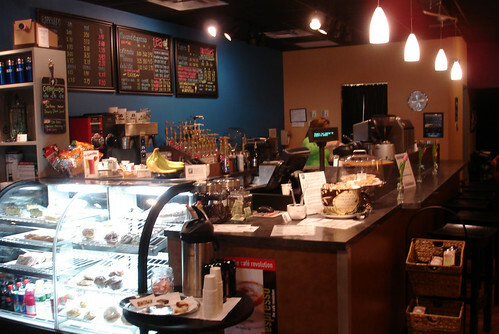 The coffee bar offers everything from your regular cup of coffee to fancy cappuccinos and lattes. They also serve fruit smoothies made with real fruit. On this occasion I had my favorite, a mocha, and my wife had a decaf latte, both of which were excellent. We both like that they use organic fair trade coffee from local roaster right here in Raleigh and only use hormone free organic milk. While the coffee takes center stage, Electric Beanz also features some tasty looking baked goods from some of the best local bakeries. They have traditional and gluten free cheesecakes from Miss Taffy’s Cheesecakes in Apex and other baked treats like muffins, danishes, and scones from both Heavenly Scents Bakery and Sweet Jane’s Bakery. They also offer a little South American flare with spinach and feta empanadas from Espiga Bakery in Raleigh. 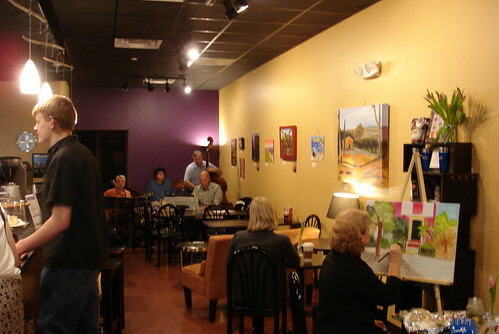 While there, we learned that Electric Beanz is a regular participant in a local event called “Art after Dark” where on the second Friday of each month they feature the work of local artists and have live jazz music performed by the Dave Reitmeyer and his Jazz Band. This month’s featured artist is Jo Cicci. She was on hand Friday night exhibiting her work and doing a little painting right there in the coffee shop. Several of her pieces will be on display in the shop for the rest of the month . My favorite piece was an acrylic canvas painting of red shutters opening out to a lush green landscape. It gave me the impression I was looking through the painting to the outside world as if through a window. I couldn’t help but think how something like that would brighten my dreary windowless office! What I really liked about this coffee bar is that it has a “neighborhood place” kind of feel you get from a business that has strong ties with the surrounding community. Of course the offer free wi-fi access and you can spot the occassional game of chess bing played, but the also support the local art and music scene which is a rare thing these days. In addition to the Art after Dark events, Electric Beanz features other local musicians on a regular basis, holds poetry readings, and even offers teen open mic nights for budding musicians. 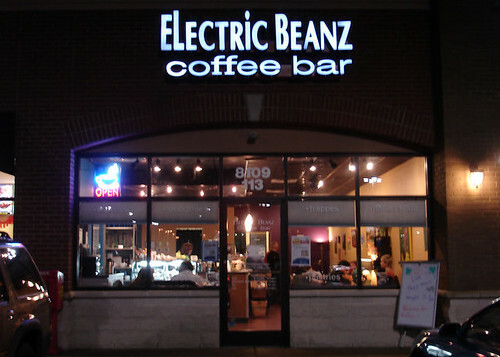 Electric Beanz is also a popular networking location and serves as one of the sites for Inside 919’s weekly Tuesday morning “coffee break” networking meet-ups. I’m really glad we discovered this neighborhood coffee bar and I look forward to visiting it again in the future. To get more information about their upcoming events check out the calendar on their facebook page or you can follow them on twitter. To view the rest of the photos from my visit, please check out my flickr photo album.